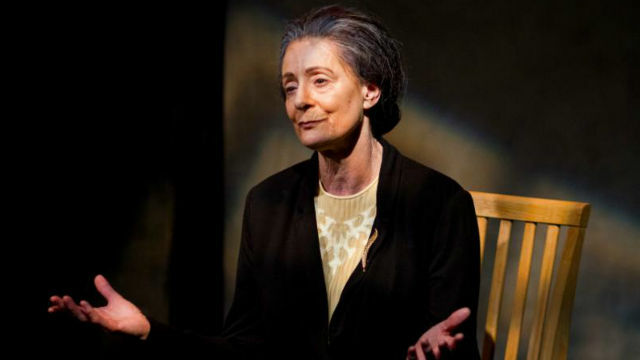 Rosina Reynolds in “Golda’s Balcony” at New Village Arts Theatre in Carlsbad. It wasn’t just in 1973 when that question was asked about Israel. But in “Golda’s Balcony,” the 2003 play by William Gibson, it comes up repeatedly. On that day, in the time of the Yom Kippur War, with Egypt and Syria poised to attack, Meir has her finger on the nuclear button — ready for a preemptive strike if Nixon and Kissinger don’t send the Phantom jets and other ordnance they promised. It was a long night by the phone, waiting for a fateful call. The Israeli cabinet gathered around a elongated table (nicely suggested, with a strip of blue, representing the Suez Canal running the length of it, in Victoria Petrovich’s spare design). World peace, it seems, was at stake, and was in Israel’s hands — a mere 25 years after statehood was established. In the play, she points to the seminal photo of herself (one of Petrovich’s excellent projections), which shows her in the kitchen, making chicken soup for the troops. As played by Rosina Reynolds at New Village Arts Theatre (part of the Lipinsky Jewish Arts Festival, directed by Festival artistic director Todd Salovey), this is no “Mamela Golda.” She’s tough, she’s aggressive, she’s no apologist. Indeed, though she dreamed of peace, and ends her 90-minute recounting with multiple iterations of “Shalom,” she sent many young men to their death to preserve what she saw as the only route to assuring the hope and survival of the struggling state. Reynolds is a formidable, potent presence. She thoroughly captures the intense emotional journey of this stalwart woman, this lifelong activist and youthful idealist, who chose Israel’s nascence over her family (she had a husband, two children, and a few lovers along the way). She expresses some guilt about “destroying the life” of her simple, soulful, non-doctrinaire husband, Morris, who died as he lived most of his life — waiting for her. The lighting (Sherrice Mojgani), soundscape (Michael Roth) and costumes (Mary Larson) are excellent. Salovey made a puzzling but intriguing directorial choice, having Reynolds onstage as the audience enters, putting the finishing touches on her makeup. The redhead stands and gives the cellphone/nearest exit curtain speech, then walks back upstage, takes off her red wig and slowly slackens her face as she dons a gray wig to morph into Meir, which she does impressively (except for a few pronunciation irregularities). It’s a powerful portrayal of a powerful woman. This time, it was her emotional responses to her life’s events — her fears, her anger, her frustrations and her tears that, in Reynolds’ capable hands, brought this controversial groundbreaker to life. Performances are Thursday-Saturday at 8 p.m., with matinees Saturday at 3 p.m. and Sunday at 2 p.m.